Why Use an Oncology Fellowship Personal Statement Writer? 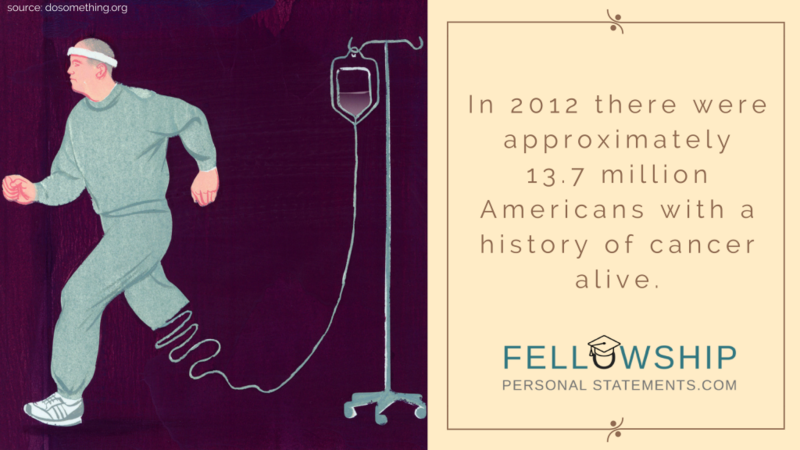 Applying for any medical fellowship with a specialty in oncology, medical or radiation type requires a high-quality personal statement. Those selected will have an excellent training in medicine, must be able to work in multi-discipline teams, and be committed to a career in the oncology specialty. Before inviting you for an interview the oncology fellowship selection board will see your personal statement. If it is original, well written and clearly shows that your skills and experience make you a good candidate, the board will be interested in finding out more about you. Recognizing it is so important, many people turn to our writing service for help with their statement. Our writers tailor your personal statement to your specific fellowship application. For instance, your neonatology fellowship personal statement will be originally written to portray you as a high-quality candidate with outstanding personal and academic qualities, and that you are a strong team player, committed to cancer treatment or research into treatment methods. Your statement should answer any questions the board may have. Undergraduate and internship studies. The board wants to know all relevant information about you such as your general medical skills, any research skills or specialist radiation treatment knowledge. Why you want an oncology fellowship? You enjoy the challenge of working with cancer patients, you enjoy the multi-discipline team approach to cancer treatment or your long term career plan is based around oncology. Your future? The board will want to know how you plan to use your skills. Show a career plan in cancer treatment after your oncology fellowship. Why this fellowship post? The school or hospital is very reputable, has research programs of interest to you, or you wish to live in the area. The board will be interested if you can show why you specifically want to be on their staff. 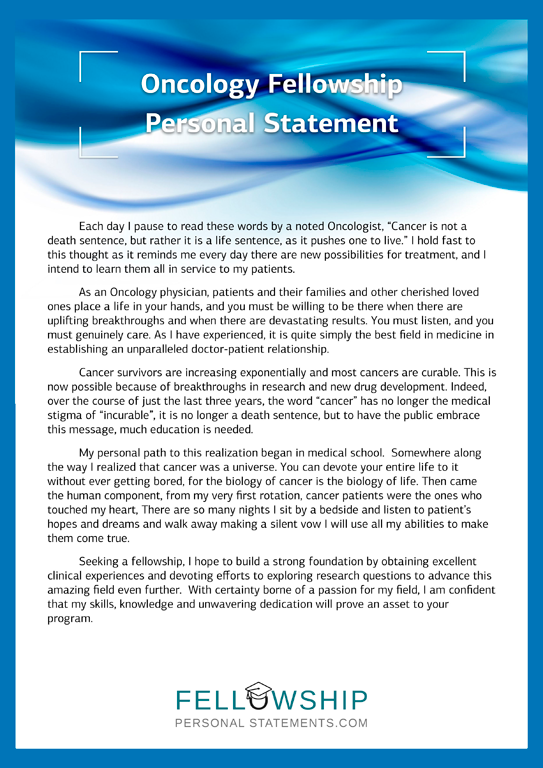 Why Choose Our Writers to Compose Your Oncology Fellowship Personal Statement? We employ high quality and experienced writers for preparing personal statement to apply for a fellowship. They are always native English speakers with a Master’s degree or PhD in a subject relevant to your application; they are familiar with the application process for an oncology fellowship and are experienced in writing statements. Using all the information you want to be included they compose an original statement for you. “My interest in medicine comes from my father. He is a veterinarian and I have spent countless hours with him in his office as he treated the various injuries and ailments of people’s pets. I admired the way he would examine a dog or cat, first soothing the animal until gradually the petting became an investigation, feeling for lumps, tender areas or something that would signal to him, a cause for the animal’s discomfort. In a matter of minutes, he would arrive at a conclusion and prescribe a cure. Over time my interest in diagnosing an illness and prescribing an antidote never lagged, but I become more interested in treating the human animal than dogs and cats. After medical school, I chose internal medicine as my specialty and have never regretted it. It is gratifying to diagnose a problem correctly. I have found myself increasingly drawn towards the study of oncology and the treatment of malignant tumors. I would like to participate in further research and eventually teach and your oncology fellowship program emphasizes research in areas I am particularly interested in. A paper I co-authored with Dr. B. Macoy was recently published in the Oncology magazine, and his research was an offshoot of research begun in your program. What Does Our Service Comprise and How Do We Maintain a High Quality? Once contracted we will have our writer contact you directly and require you to provide your personal information and your deadline. Your statement is always delivered before your deadline, is always proofread, and always checked to be free from plagiarism, a recognized problem in higher education. You can make as many alterations as required. If at any time you are not happy with our service then a full refund is guaranteed. So if you are looking for help with your oncology fellowship personal statement just contact our experts for reliable and affordable help!